For the past almost 2 years I have been doing paranormal radio. It literally was something that just fell into my lap. I received an email from a guy named Gypsy asking if I would like to Co-host a radio show on a local small network. After doing research to make sure this guy was for real, I asked if he wanted to interview me first; his response was basically “No, that isn’t necessary; I think you’d be perfect for this”. Ok then! I knew nothing about running a radio show, but I am always up for a challenge so I did it! The show was called “Mysteries Explained” and we were going to talk about things that were paranormal, this was right up my alley. It was on ipo radio; a local station that you could find online. We didn’t really “fit” into the stations line up though-it was mostly music and more of a heavy metal type music at that. Still, the show had a weekly schedule of Thursday’s from 4-7pm. I was thrilled to be doing it, I was shocked that after only about 3-4 shows I was told: “ok the show is yours now, have fun with it”. That’s when I enlisted the help of my co-host, Dave. Together we started doing the weekly show and talking about all things paranormal. From our latest cases that Tucson Ghost Society has done, to things we saw in the news, and we even started bringing guest onto the show. We started by asking other teams to come be on our show to talk about their experiences and then was able to start getting writers and even tv personalities on the show. Our show would always go off track but it was always fun and we threw in a lot of laughs. Still, as much as we were thankful for the radio station we were on & the kind people there; we just didn’t feel as if we fit into the programming. Well, one day I was asked to guest on another paranormal radio show, so as I was talking to the host I had heard them mention that they wanted to start a network of paranormal radio shows. 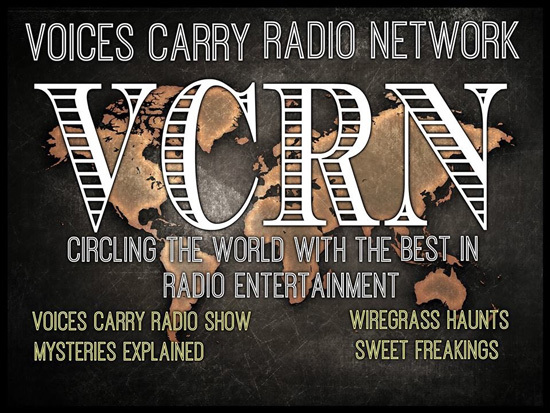 So after the show, I talked to them and the Voice Carry Network on Spreaker took us on. We kept our Thursday nights but now air from 8-10pm eastern. Our show was now able to be played back if you missed it too and we were on a network that was just paranormal. We found a new home and love it. We were able to get even more people on and my dream of getting my fave person, Grant Wilson, came true. The show is now also on iHeartRadio and will be on Pandora and TuneIn starting in July. It’s great to be on such a great network with other paranormal shows like our own. The greatest part is now my husband is even able to be a part of the show too. We talk about ghost, investigations, UFOs, Bigfoot, and so much more while having guests come on the show and having some major laughs. We try to educate, along with inform and entertain. If you are truly into the paranormal and have been following my monthly articles; then maybe you should check out the paranormal radio shows and discover so much more about the field and have some laughs while you’re at it. In the meantime Tucson Ghost Society has some new exciting places coming up to investigate and I look forward to writing about those experiences in the upcoming months. Till then though, remember you are never truly alone!